Holy Clippy, the day is almost here. Windows 7 launches this Thursday, October 22, bringing an end to three glorious years of delightfully droll Vista punchlines. There's plenty to consider when it comes to the new OS -- how to upgrade, which edition to buy, what to do if you're jumping from XP -- but what about which retailer offers you the best free stuff? After all, an event big enough to warrant launch parties is sure to inspire plenty of giveaways. Well, fear not, my fellow freebie-hunters -- we've got you covered. Here's a rundown of some gratis goodies you can pick up along with your shiny new Microsoft software. For a look at some standout deals on new Windows 7 systems, be sure to also check out Ian Paul's "Six Great Windows 7 Computer Deals." CompUSA will start comping early with midnight events at 10 of its retail stores. The first 77 people to show up at each event will get complimentary $77 gift cards. Even if you aren't early, you'll be able to win free Windows 7 installs and one of 77 new Windows 7 dual-core PCs being given away as part of the launch. The CompUSA events will be held at the following locations (click for a map): Miami-Dadeland (FL), Altamonte Springs (FL), Clearwater (FL), Deerfield Beach (FL), S. Jacksonville (FL), Plantation (FL), Hoffman Estates (IL), Naperville (IL), Raleigh (NC), Plano (TX). Remember, it's midnight on October 22 -- so it'll actually be Wednesday night. You can pick up piles of free software when you buy Windows 7 at any Office Depot store. The chain is offering rebates for 19 different titles, ranging from AVG's Internet Security Suite (regularly $70) to Greeting Card Factory Deluxe (regularly $50). Note that you will have to pay for the products at purchase; most of the rebates require a mail-in form in order to get your money back. Here's a full list of the free software that's available. If you want some extra help with your Windows 7 install, Staples may be the place for you. The retailer is promising free installs on any Windows Vista system between October 22 and October 31 with this coupon. If you're thinking of tossing your old Vista laptop or netbook, Staples will also give you $75 off the purchase of a new Windows 7 PC purchase for trading it in. Finally, any Windows 7 purchase -- complete system or standalone software -- will net you a coupon book with $500 worth of savings. 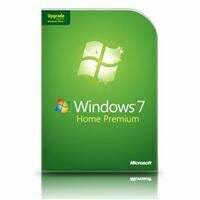 Other stores, such as Best Buy, are offering free express shipping on all new Windows 7 systems. And Microsoft itself is handing out free copies of the OS at its "New Efficiency" events around the country. Some of them are already booked up, but others are still accepting reservations. You can check here to see if one is being planned near you. If all else fails, you can always stop by my place. We may not have the flashy giveaways, but by golly, we'll have some fantastic games of Ballmer Chair Toss and BSOD Freeze Tag. JR Raphael grows heart-healthy geek humor at eSarcasm, the most popular Web site ever (based on a survey of four stray cats).